Looking for a Valentine's experience to share with that special someone? 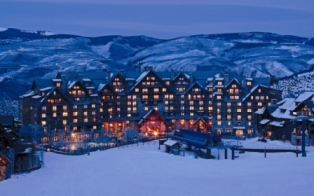 Here is a guest post from the folks at the Ritz-Carlton in Bachelor Gulch (Beaver Creek, Colorado). I have not had the pleasure to personally review the experiences listed below, but I can certainly vouch for the Ritz-Carlton Spa in Denver (and I have). Whether Cupid is striking for the first time or you are in need of igniting an old-fashioned romance -- The Ritz-Carlton, Bachelor Gulch is the address to make a declaration to your loved one this Valentine’s Day. From 7’s perfect ‘last minute’ yet romantic house-made après offerings slope-side, including gourmet gift baskets with selections by Dylan’s Candy Bar, themed treats and splits of bubbly from $65 -- to indulgent overnight spa packages or a sumptuous gourmet dinner -- there is no unrivaled setting to set the tone from February 10th through the 14th. Colorado’s only outpost of Master Chef Wolfgang Puck’s Spago will feature a prix-fixe five-course menu at $95 per person – highlights include savory delicacies such as Spicy Ahi Tartare, Black Truffle Agnolotti, Surf & Turf with Kobe NY Strip and New Zealand Langoustine Tail, a decadent ‘passion’ torte and more. The award-winning venue will also offer its popular seasonal menu. Couples Massages - All Couples Massages received during these dates will receive a special amenity valued at $40. (Prices vary based on duration of massage). For those who wish to ‘take home’ the essence of The Ritz-Carlton, Bachelor Gulch to their object of affection, the Spa Boutique has thoughtfully assembled the Valentine's Day Romance Bath Basket for $75. The amorous collection includes Tara "Loving" Massage Oil, "Loving" Bath Oil, two Loofas, a Candle, and Organic Pomegranate & Fig Rose Petal Bath Bubbles. For guests enjoying a rendezvous in-house, the creative expression may be even more special by adding Chocolate Covered Strawberries, a Half-Bottle of Sparkling Wine & a Personal Bath Butler Service for an additional $50. Finally – nothing says ‘I love you’ like baubles! The Signature Shop will offer 15 percent savings off an array of eye-catching accessories at the Mauri Pioppi Fine Jewelry Trunk Show, February 11 through 13, from 10 am to 7 pm. The Ritz-Carlton, Bachelor Gulch ensures everyone the perfect way to impress and express their love. Happy happy Valentine's Day to you and yours from me and mine. Bachelor Gulch is a DREAM. Add the Ritz-Calrton's spa and that is out of this world! I LOVE this place! I once had a pedicure and giant ice cream sundae (at the same time, it was a package deal). One of the most luxurious pedi's I've ever had! All this massage talk has me daydreaming of a getaway. I love spas. LOVE the location and the Ritz both -- wow! Possibly the perfect Valentine get away.